Once I mastered the paddle boarding basics, my next challenge was finding a board that was designed for performance. 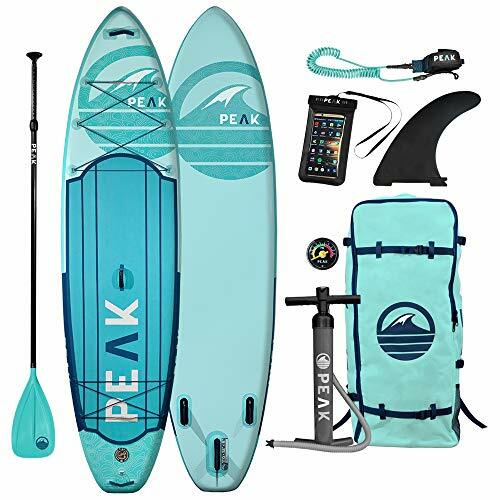 Most paddle boards on the market are meant for leisure activities and so, there are few that are designed for touring or speed. With some time, effort, and research, though, I was able to narrow down the best paddle boards for racing/touring. In this guide, I will take you through some of the finer points of selecting a paddle board that works equally well for racing as well as touring. You will also get to see my top picks in this category and learn just what I like about them. Before going any further, lets first narrow down on racing/touring boards are different from some of the other categories. To start with, racing/touring boards are meant for advanced riders. Since these boards prioritize performance above all else, they aren’t suitable for beginners. 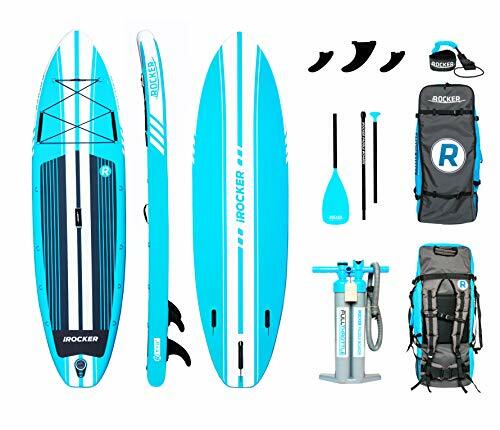 The dimensions and the design of the paddle boards also indicate that these boards are meant for just one rider. Also, while many of these boards do have storage options, adding any more weight onto the board ensures that it will slow down. It could also be harder to stabilize. The average racing paddle board is around 12 to 14 feet long. Most touring boards, on the other hand, are quite a bit shorter. However, since you are looking for a hybrid board, it is best to consider one that is around 10 to 11 feet in length. It is important to remember that the longer the board is, the more smoothly it will travel over the water. This is a useful feature when you are trying to balance both speed as well as covering distance. At the same time, longer boards do have a tendency to be a little trickier to stabilize. With racing paddle boards, narrower means faster. This is why many racing boards are around 28 inches wide and are sometimes, even thinner. These boards do, however, compromise on balance and stability quite a bit. As a result, they are a lot more difficult to stay on top of. Since you are looking for a racing/touring board, it is important to look for a board that is a bit wider than a racing one – but not that much wider. As such, you should opt for one that is around 30 inches. It is important to keep your height and body type in mind, though. If you are on the taller or bigger side, a 32 inch board may provide you with a little more surface area. Most paddle boards are between 4 and 6 inches thick. It is best to go for one that is around 6 inches, even though these boards are often a little heavier. This is particularly important if you are opting for an inflatable paddle board. Understand, paddle board thickness is directly correlated to both rigidity as well as stability. So, by choosing a board that is thicker, you can be certain that it can support your weight. Not to mention, thicker boards may also be easier to maintain your balance on. Now, racing/touring paddle boards are longer and narrower. In many instances, this means that these boards aren’t equipped to carry as much weight as some of the other categories. This is why it is important to always check the weight capacity of each board before you buy it. You should select a board that is more than capable of handling your body weight. 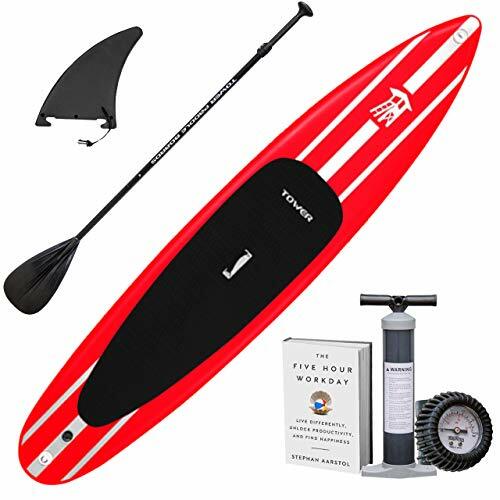 If you want to travel long distances on your paddle board, then you should make sure that it is equipped to carry your bags and supplies as well. When it comes to choosing hull designs, you will need to select between a displacement and planing hull. Since you are looking for speed and performance, the best option for you here is with a displacement hull. This type of hull can be identified by its long, narrow, and pointed design. The benefit with displacement hulls is that they divert the water to the sides of the board, ensuring that there is no water slapping against it. As a result, the board is able to move through the water which actually makes for a smoother ride. Of course, this particular hull doesn’t help a great deal with balance. In many instances, a reduced weight does help racing/touring boards perform better. So, if you are looking for a solid board, check for one that is made of a lightweight material. Your best options are either carbon fiber or Kevlar. 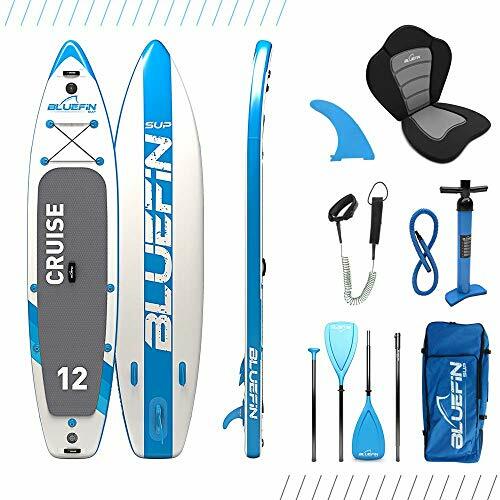 If you are searching for an inflatable paddle board, durable PVC material is the best. When combined with heavy duty drop-stitch technology, these boards are as durable and as rigid as a solid paddle board. This paddle board is definitely at the top of my list for boards to choose for racing/touring. What I like most about this board is that it is able to strike a number of balances to ensure that you get the best of both worlds. Now, to start with, the board boasts a displacement hull and a length of 12’6 that is great for picking up speed. So, you will have no trouble covering greater distances in a relatively shorter period. At the same time, this board is a bit wider – 31 inches – than what you would expect. However, rather than slowing the board down, it simply makes it more stable. Thanks to this, I found that I didn’t have to work so hard to maintain my balance when out on the water. Another point in this boards favor is that it is great value for money. Made from tough, marine grade PVC, this board can withstand most of what you throw at it. What’s more, the weight capacity on this board is pretty decent at around 275lbs. The board isn’t perfect, though, and what part I struggled with was the inflation. After you get to a certain PSI, inflating this board to full volume can be incredibly tiring. Are you looking for a paddle board that is as fast as it is smooth? If so, I would highly recommend this particular make and model. The 12´6 length ensures that this board is able to move smoothly through the water and I found that it was no issue at all to cover a longer distance without tiring out. Adding to this action is the displacement hull which easily cuts through the hull. All in all, I was pretty pleased with the kind of speed that this paddle board could rack up, even when I wasn’t making much of an effort at all. At first glance, the design did have me worried about just how much weight this paddle board could hold. According to the manufacturer, this board can hold up to 350lbs. While I didn’t test its full capacity, the board was perfectly rigid under my feet at all times. Not to mention since its ready to ride at around 10 PSI, you don’t have to wait too long for it to inflate to the right point. My main concern with this board, though, is regarding its durability. Although there were no punctures, it wasn’t long before it began to show signs of wear and tear. The first thing that you should know about this paddle board is that it isn’t the fastest paddle board around. This is fine, though, because it isn’t meant to be. This paddle board strikes an excellent equilibrium between performance and balance. So much so that I would recommend it to those who were slowly making a move over to speedier boards. The paddle board is 11 feet long and this certainly helps with the speed and movement. At the same time, the base is 32 inches, providing you with a much more stable platform than other racing/touring boards. In general, though, I noticed that it was much easier to maintain my balance on this board. What I wasn’t as comfortable with, however, was the weight capacity. Although the manufacturer says that it can hold up to 350lbs, it loses some rigidity when a greater weight is placed on it. This board is also a good option if you are headed out into any area where your board may get dinged or scratched. 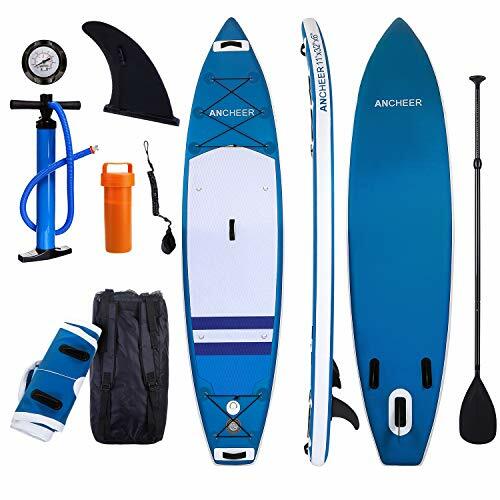 The paddle board boasts a double layer, military grade PVC outer layer with drop-stitch construction. You can be quite certain that this paddle board will not get a scratch on it. This board is specifically designed for ultimate performance. Of course, you should know that with a length of 12 feet and a 30-inch width, this isn’t the easiest board to master. So, you should be a seasoned rider before you to decide to take this paddle board out. However, if you are confident in your skills, you will really be able to enjoy what this paddle board has to offer. The movement is smooth and the board easily cuts through the water, getting you where you need to go, only much faster. I would say that the paddle board holds up rather well as far as rigidity goes as well. A six-inch thickness ensures that the board will always be completely firm under your feet. This is further aided by the fact that the shell is made from military grade PVC and has overlapping seams for even more durability. So, you can be sure that this board will not be deflating any time soon. Also, since it can be inflated between 12 and 15 PSI, the inflation process doesn’t require too much effort from you. The one disappointing thing here is that, sometimes, the valve can open up when disconnecting the pump, letting the air out. This is yet another racing/touring board that manages both balance and performance, almost in equal measure. The 11 foot length on this paddle, along with its well-designed displacement hull ensures that you are able to cut through the water quickly and smoothly. So, covering long distances or even beating out other, standard paddle boards shouldn’t be too much of a problem. At the same time, the 32-inch width means that you will also have a much easier time balancing on this board. The other benefit of this paddle board is that it inflates rather easily. This, of course, has a lot to do with the fact that you get a dual hand pump along with the board. Also, when fully inflated, the paddle board achieves impressive rigidity. This, along with the six-inch thickness, further improves your stability. The one downside that I would point out is the fact that this paddle board can’t take nearly as much weight as it claims. While the manufacturer states that the board is suitable for a total weight of 435lbs, I wouldn’t put too much faith in this. However, most adults should have no trouble fitting on this board. With a hybrid nose, this paddle board is one that you can use for a greater number of activities. This is what makes it such a great option for a racing/touring paddle board. The board is 11 feet long and the result of this length is a smooth movement through the water. I was also impressed by just how fast that this board could move with just a little bit of effort. At the same time, this board is a breeze to balance on. With a width of 32 minutes, you will find yourself maintaining your balance without any issue at all. I also noticed that this was one of the more comfortable boards to ride on. Even if you spend hours on it, the EVA foam doesn’t wear you out at all. Despite the sheer size of the paddle board, it was actually quite lightweight. So, carrying it around is pretty simple, regardless of whether it is inflated or not. My biggest issue with this board is that it can be really tiring to inflate this paddle board. Depending on your strength level, you may need an additional person to help you out. All of these paddle boards work really well for racing/touring purposes. 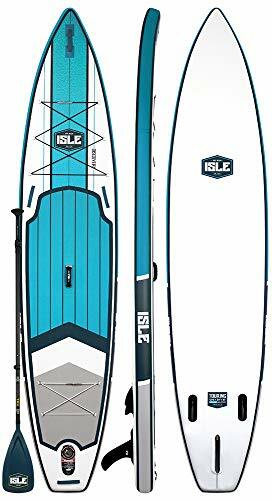 However, if I had to just pick one, I would suggest the ISLE Discovery paddle board. While it is performance oriented, the board is still rather easy to maneuver and work out on the water. Due to this, it hits all the necessary marks and so, is suitable for most people with the proper skills. If you are looking for a racing/touring paddle board, then this guide will help you out. It contains all of the information and help that you will require to make a decision.